I'm just trying to create an effective Google reference here for the hotel we stayed in during our recent excursion to Florence and Rome. 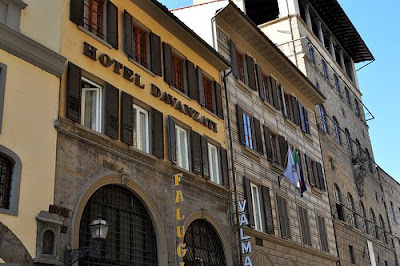 Just today I received an invitation to rate our hotel in Rome, and I did my best to be nice, although our experience in Florence was so fine that I went into Rome with a chip on my shoulder, seeing every flaw. After the inexplicable decision to DRIVE to Florence -- on Italian highways, with Italian drivers, culminating in the plate of spaghetti which is the road-map of medieval/renaissance Firenze -- we screeched into the available pocket of cobblestone in front of our hotel on the Via Porta Rossa, and my by-then-frazzled chauffeur & spousal unit mounted the 26 steps, rode the phone-booth sized elevator (we came to call it the Tardis), and arrived at the front desk in melt-down mode. From behind the desk the dapper second-generation owner, Fabrizio, thrust out his hand and welcomed his customer by name, and my husband was won over instantaneously. From there is just got better. 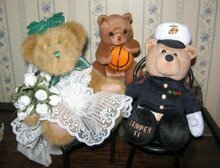 Our luggage was lugged upstairs by the staff, our car was whisked away for safe-keeping, and we were ushered into our cool, crisp, comfortable room with the giant tempurpedic bed. Calm suddenly reigned. We were soon refreshed enough to walk to the Duomo for evening Mass, we found a light supper on the way back, and became gradually aware of how perfectly placed we were for an enjoyable stay in this amazing city. All this, and Happy Hour too. Italians have this way of not eating dinner until 8:00-9:00 p.m. -- we seldom made use of it, opting instead for a good lunch and an evening snack. But to help us non-Italians through the pause before the dinner hour, the Hotel Davanzati puts on the jazz recording, dims the lights, and opens up the breakfast room and lobby for Happy Hour, 6:30-7:3 0, with Prosecco, Chianti, and munchies, ON THE HOUSE! Prosecco, I have discovered, has incredible curative properties, especially below the ankles. A-a-a-h-h-h.
We were only in Firenze for four days, and could only make plans for what we need to do on the second visit, sometime in the near future, but enjoyed it immensely (oh the peace of the San Marco Convent -- a surprise in every box! 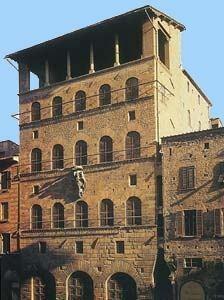 ), with all its pleasures enriched by the comforts and hospitality of the Hotel Davanzati. 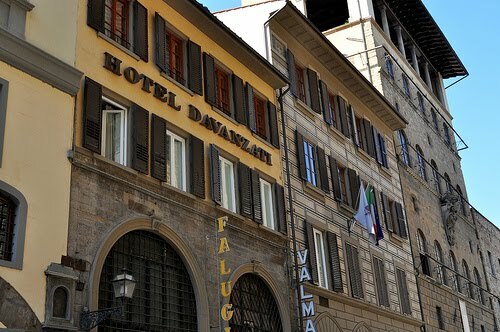 And, to no great surprise, the hotel is right next door to the Palazzo Davanzati, which is AWESOME. A medieval must-see. Posted by Winefred at 11:05 a.m.